Each year, the college’s Alumni Board recognizes outstanding alumni and faculty to be honored at the annual Celebration event for their outstanding achievements, service to the community and enduring impact on students. We look forward to hosting our outstanding alumni during awards week in April, when they will be recognized for their achievements at The Celebration alumni awards ceremony and strolling dinner on Saturday, April 13, 2019, in the WKAR Studios at the College of Communication Arts & Sciences. Recognizes alumni who have obtained the highest level of professional or academic accomplishment and demonstrated service to the College of Communication Arts & Sciences and the community. Be a graduate of the College of Communication Arts & Sciences (ComArtSci) at Michigan State University. Have achieved significant recognition or accomplishment in their chosen field (business, academic, military/government, the arts, etc. ), community service or University service. Be able to accept the award in person and participate in the award recipient panel discussion and awards ceremony/dinner at ComArtSci. We are in the process of celebrating our 2019 honorees. A new nomination window will open soon. Honors an alumnus or alumna who graduated within the past 10 years and has a strong record of accomplishment and service to the community. Have graduated from ComArtSci within the past 10 years. Be able to accept the award in person and participate in the award recipient panel discussion and awards ceremony/dinner at the ComArtSci. Presented to individuals for their continued support and volunteer service to Michigan State University and the College of Communication Arts & Sciences. 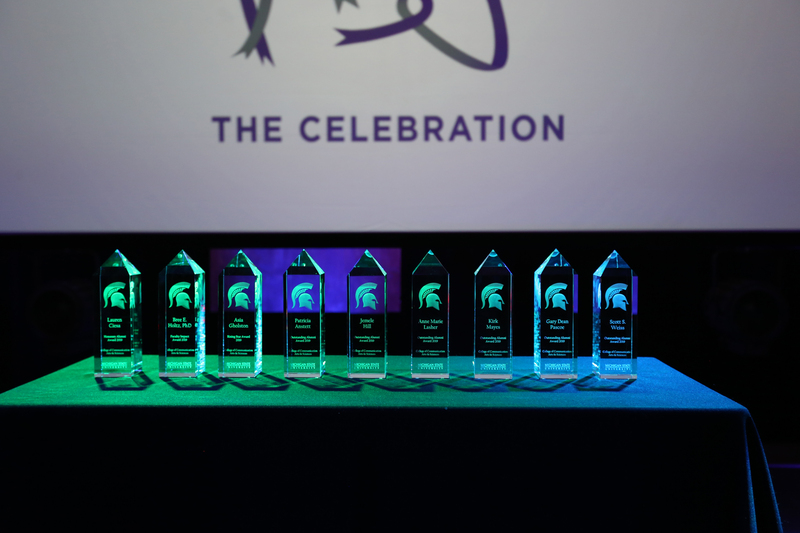 Email casalum@msu.edu if you are interested in nominating an individual for the Honorary Alumni Award. Created by the College of Communication Arts & Sciences Alumni Board, the Faculty Impact Award is given annually to a current ComArtSci faculty member whose dedication to teaching and mentoring has had a noteworthy and enduring impact on the lives and careers of his or her students. This is an award designed for faculty members who have changed lives through classroom excellence. Previous Faculty Impact Award honorees are not eligible to receive the award again. Past honorees listed below in the Past Alumni Award Honorees section. Eligible nominations are reviewed by the ComArtSci Alumni Board. Award selections will be made in February 2019. In addition to being recognized at the College's annual alumni awards ceremony, the Faculty Impact Award honoree and their home department will receive a monetary award.